The under-representation of women in many academic fields and professions has been well documented and continues to attract attention. But is the under-representation of women’s voices even more severe within certain sub-disciplines and issues? Is it worse at the upper echelons in these spaces? And should we be more concerned about some gender inequalities than others? My experiences, observations and reflections working on ACC both inside and outside the academy suggests the answer is “yes” to all of these questions. Take one of the most frequently used teaching resources in philosophy on ACC – “Climate Ethics: Essential Readings” (Gardiner et al. 2010). Not one of the entries in this collection is written by a woman. Similarly, a recent event organised by philosophers on justice and climate transitions, officially associated with the UN’s COP21, featured multiple all male panels. 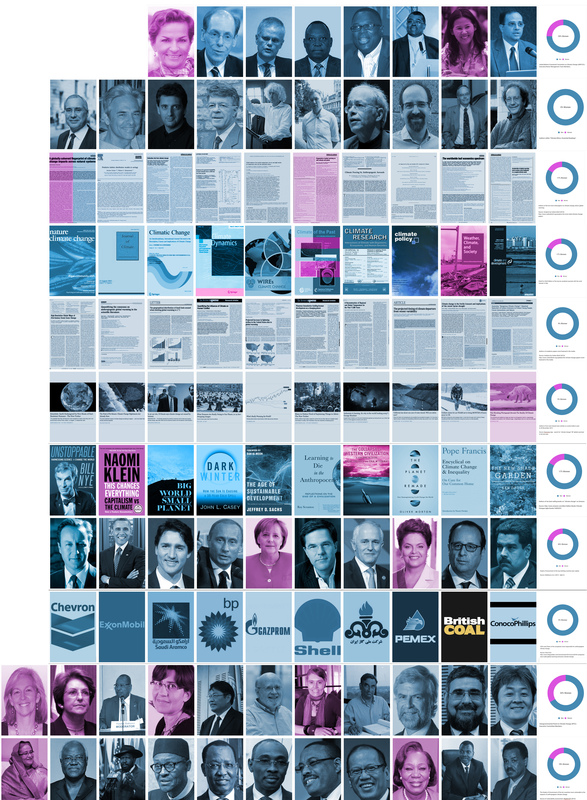 Looking at the climate science itself, just 17% of the lead authors of the ten most cited papers are women. We find the same percentage (17%) when we examine the Chief Editors of the ten highest ranking journals on climate change, and the authors of the ten best-selling books. The situation is worse when we consider the academic papers that have attracted the most attention in the media, with none having a female lead author. Journalists who write about ACC are critical conduits of knowledge from experts to lay people, but these writers and broadcasters are overwhelmingly men. Of the ten most shared news articles on social media in the year to date, only one was written by a woman. Analyses conducted last year also reveal that male voices account for over 85% of people quoted in media about ACC. Unfortunately, little improvement in gender balance can be found at the higher ranks of the state and within corporations. Notably, none of the CEOs or Chairs of the top ten companies responsible for the most greenhouse gas emissions are women. Only two women reside at the helm of the governments of the ten countries most responsible for ACC, and only two more can be found leading the governments of the ten countries most vulnerable to the impacts of ACC. Although the United Nations Framework Convention on Climate Change (UNFCCC) has taken commendable steps to improve gender equality in recent years, the UNFCCC’s own senior management team falls short of these aspirations, with just two of eight members women. The gender composition of the Intergovernmental Panel on Climate Change’s (IPCCs) executive is slightly better, with women making up a third of its voting members. Although this is only a brief survey of some of most high-profile and influential social roles associated with ACC, across the roles surveyed, just 14% are occupied by women. However, we cannot conclude from the mere existence of a gender imbalance that there is a problem. It could be that women just aren’t interested in ACC. If this is the case, then there may not be an issue here to solve. However, as women are generally much more concerned about ACC than men, it is unlikely that this is the case. But even if it was the case, there are at least three reasons why we should care about and ensure we address the under-representation of women across all aspects of climate change. First, there is good evidence to suggest that women’s participation and progress in society – and thus across all aspects of ACC – is impeded by two psychological phenomena: implicit gender bias and stereotype threat (Beebee & Saul 2011; Saul 2013). These subtle, systematically gendered personal and social barriers are often unintended and generally operate below the conscious awareness of both men and women. Consider, for example, Roger Harriban’s description of Claudia Salerno (a Venezuelan delegate) on Radio 4 last night as the “drama queen” of the climate talks. The net effects on women amount to a cumulative disadvantage that Rossiter (1993) dubbed the ‘Matilda Effect’, which stands in contrast to Merton’s (1968) ‘Matthew Effect’ of cumulative advantages (Wylie in Grasswick 2011). Such psychological phenomena and consequent behaviours ultimately lead to an inequity in the real opportunities open to women and men, providing us with good reasons to actively pursue higher levels of gender balance in ACC. Second, there are epistemic reasons for enhancing women’s participation in inquiries and discussions about ACC. Feminist standpoint theory elucidates how our structurally defined social location systematically shapes and limits what we can possibly know, what we take knowledge to be, and what the epistemic content is (Wylie in Figueroa and Harding 2003; Wylie 2012; Intemann 2010). More women within conversations about ACC would bring a greater variety of views and more representative perspectives of society, and facilitate the adoption of strategies and actions that more successfully and comprehensively addresses people’s diverse interests and priorities (Tenzing et al. 2015). Certain kinds of diversity can therefore enrich inquiries and be of theoretical, practical, social, political and philosophical value. Women’s situated knowledge should be recognised as positive resource crucial to our full understanding of ACC and to developing the best (and most just) strategies to respond to it. Finally, because ACC is expected to impact women to a greater extent and in different ways than men, there are additional rights-, justice- and fairness-based reasons to promote women’s participation and representation in issue-influencing and decision-making spheres at all levels. Overlooking the participation of women is likely to only lead to inequitable outcomes and exacerbate existing gender inequalities (Tenzing et al. 2015). This has been one of the key motivations of the development sector in its push for gender sensitive and gender responsive action on ACC. Perhaps, then, the probable, large-scale, asymmetric risks, wrongs and harms, and the (re)distribution of social power associated with manifestation ACC means that we should be more concerned about – and hence prioritise addressing – the under-representation of women in ACC and alike issues and/or sub-disciplines? Whilst the lack of women’s voices in say probability and time travel or abstraction may be a matter of concern, surely the under-representation of women across all aspects of ACC is a scandal. Thank you to Professor Alison Wylie for a helpful conversation on this topic, and to Ruth Crook for a useful resource. Data used to generate images can be found here. If anyone who appears in any of the images wishes to be represented by a different colour because they are trans* or genderqueer, please contact me. Points 2 and 3 of yours point to instrumental reasons why we should be concerned with gender discrimination/participation reasons in ACC in particular. While I accept these are plausible channels for impacting the outcome, I think there is an onus to show that these effects would be significant. This may be my lack of knowledge on the particular subject, but if we believe there are some idealised macro economic/political responses to ACC, how much closer do you believe a perfectly just gender participation share would get us to this? My strong prior is that 95-99% of the current gap between current proposals and idealised ones are due to other factors. Are there examples of systematic differential policy suggestions provided by men and women? I of course don’t disagree that the under representation of women in upper-echelon roles is a significant problem more generally. Collecting evidence to support these kind of arguments is hard, because we are ultimately talking about a counter-factual world. However, I see today that the Financial Times has reported that Boards with more women have a 36% better return on equity (http://www.ft.com/cms/s/0/7325af98-9a9d-11e5-a5c1-ca5db4add713.html#axzz3td3Q13W9). This result is consistent with other findings throughout the business world (e.g. see: http://www.womenonboards.co.uk/resource-centre/selected-reading/why-women-are-good-for-business.htm). I don’t think any great leap is involved in thinking that we might achieve better results in climate change related policy if more women were involved, including at the higher ranks. Perhaps some of the fundamental knowledge may not change (e.g. that Earth’s climate system is warming and that this warming is in part attributable to human activities), nor what actually needs to be done (broadly construed), but perhaps we may have reached an international agreement quicker, especially because womens’ and mens’ preferences for risk tolerance are different. It’s a little easier to give you good examples of how greater inclusion of women change climate change adaptation policies at local scales though, especially in developing countries where strict gender norms still exist. E.g. as women do much of the gathering of water and other natural resources for the household, they are much more aware of how these resources might respond to different management strategies. More detail can be found in publications like Anderson 2006 (http://simonbarker.is/The%20Epistemology%20of%20Democracy%20-%20Elizabeth%20Anderson.pdf) and Tenzing et al. (http://pubs.iied.org/17313IIED.html). Hi Erin, thanks for this post (and all the research on the numbers!). While I agree with your general line, there is a question about non-ideal circumstances here. One might run an argument along the following lines: the world is gender-unjust, and powerful men tend to be more impressed by arguments made by other men than by arguments made by women. So as long as the majority of the people who – very roughly speaking – CAUSE the problem is male, it might be better to also have a male majority among the people who try to ADDRESS the problem. It matters most that we find solutions, and if, in today’s situation, this is more likely to be achieved by men, we should send male delegates. I’m not quite sure myself what to think about such an argument. It might depend a lot on one’s assumptions about how strong the different effects are. It’s also a VERY non-ideal argument. But arguably, climate change is such an urgent matter that we need to concentrate on the here and now, however non-ideal it may be. I’d be interested to hear what you think about this line! Thanks for this very interesting reflection. I hadn’t thought of it myself beforehand so I’ve enjoyed pondering my answer to it. I think the most concerning aspect of such a situation would be that it seems we’d end up with a vicious circle/cycle. If men are only or are more impressed by the arguments of other men (1), then it seems that we’d end up with gender imbalances perpetually. Perhaps you could say that such a response is just a once off response in virtue of the special, urgent case of climate change, and that it ought not set a precedent. I think though I’d push hard against the assumptions such as (1); and that (2) solutions developed by men or overwhelmingly by men are the ‘best’ solutions even within the very non-ideal and urgent circumstances we find ourselves. Moreover, the gradual addition of women to spheres of inquiry, decision-making, and communication provides women with an opportunity to propose solutions and demonstrate that they too have good arguments and solutions, which would start to undermine the status of (1), even if it were presently true/approximately true. Erin, I wonder if you could expand somewhat on the specifics of reason 2, particularly in terms of disaggregating when and in what ways diversity of input is valuable. To clarify that question, imagine separating decision-making about responses to climate change into three stages: (A) registering interests and views, (B) negotiation and policy-making, (C) implementation. As I understood some of your data (such as the composition of the UNFCCC panel), you suggest that greater gender equality at stage B is important. The others may also be important, but I want to draw focus to B because it is an important concern of your data and I am interested to ask whether your arguments speak directly to it. An argument from diversity for equality at Stage B would seem to need an appeal to the value of diversity in, e.g., negotiation and general level policy-making. I find this thought quite appealing, but I wanted to ask whether it is this kind of quite specific connection you had in mind, and whether the case from the epistemic diversity speaks to this more specific connection (rather than, say, greater involvement of women more generally, at “some” stage(s) of the process)? Hi Andrew, thanks for your comments and questions. This is just a temporary response to let you know that I’m working on a reply to you, but that I’d like to discuss it with Alison Wylie (a philosopher who helped to build ‘standpoint theory’) first.